Techniques to ablate persistent atrial fibrillation (AF) continue to evolve. Recent technological and strategic innovations have included a focus on mapping and ablating AF sources. These attempts have not yet yielded a consistent improvement in clinical outcomes following AF ablation. Advancements in these techniques in the next few years, however, may enhance our ability to map and ablate AF as well as further our understanding of the mechanisms behind AF initiation, perpetuation, and recurrence. Dr Latchamsetty has no conflict of interest to declare. Dr Morady is on the scientific advisory board of Acutus Medical. Arrhythmia & Electrophysiology Review 2018;7(3):165–8. Catheter ablation of AF has shown steady growth over the past two decades with a nearly 15 % annual increase in the US.1 This growth can be attributed in large part to four factors: an increase in operators and institutions performing the procedure;2 a steady rise in AF prevalence, which is predicted to reach 12 million in the US by 2030;3 a larger spectrum of AF patients with more complex atrial substrates being offered ablation;4 and the development of technologies such as the cryoballoon catheter, that have facilitated the ablation process. The increase in patients with persistent and long-term persistent AF undergoing ablation has highlighted the complexities and heterogeneity of AF mechanisms and challenged operators to optimise ablation strategies. While pulmonary vein isolation (PVI) alone has yielded favourable results for ablation of paroxysmal AF, success rates with PVI alone for patients with persistent AF have been significantly lower.5 Bolstered by advances in mapping technology, recent searches for alternative or adjunctive ablation strategies have included real-time mapping and ablation of potential AF sources. While some initial studies have described promising results utilising this strategy, randomised controlled trials evaluating its effectiveness are lacking. Appreciating the potential advantages and limitations of this strategy requires a fundamental knowledge of the mechanisms behind the initiation and perpetuation of AF. 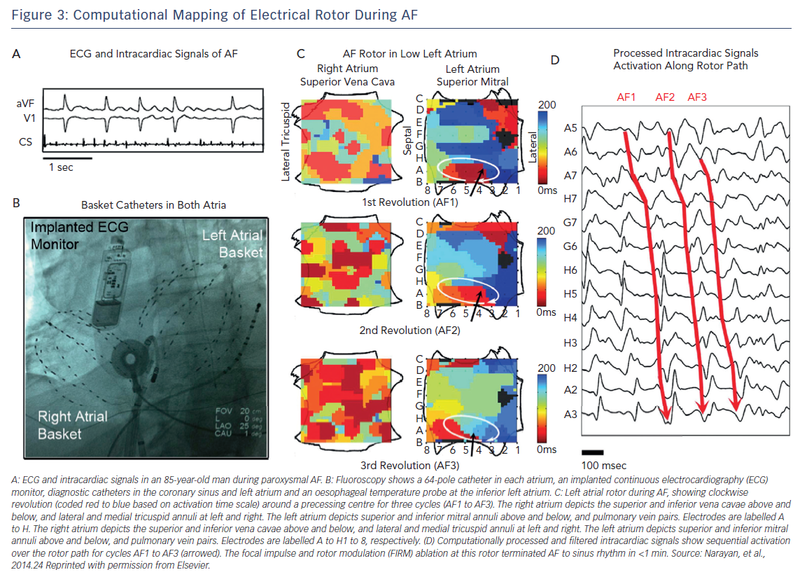 In this review, we will begin with a description of the current understanding of mechanisms driving AF, then discuss the challenges behind real-time AF mapping and signal analysis, and conclude with an evaluation of existing systems and strategies to target AF sources during ablation. The proposed mechanisms of AF dating to the early 1900s include focal automaticity, organised re-entry or multiple re-entrant wavelets.6–9 Technological advances since then have allowed us to better conceptualise these principles. Focal triggers and drivers within the pulmonary vein muscle sleeves and in the antral regions of the pulmonary veins have been found to be the predominant mechanism of paroxysmal AF and wide-area PVI has yielded favourable results in patients with paroxysmal AF.10 In addition to the pulmonary veins, other areas identified to harbour focal drivers include the superior vena cava and the coronary sinus.11 While focal triggers may be the dominant mechanism in paroxysmal AF, multiple mechanisms often coexist in patients with persistent AF, with variable mechanisms accounting for the initiation and perpetuation of AF. Among the challenges to distinctly visualise AF mechanisms are the limitations of traditional electrogram activation mapping using conventional catheters. This technology suffers from limited spatial and temporal resolution, the small region of atrial tissue able to be simultaneously recorded, and vulnerability to corruption from far-field signals.12 After signal acquisition, further analysis is necessary to identify potential ablation targets. Alternative mapping techniques can overcome some of these limitations to better understand AF mechanisms, although some of these technologies are not practical to utilise in vivo during ablation. Utilising optical mapping with high spatial resolution in sheep hearts in which AF was induced, Jalife et al. characterised discrete high frequency re-entrant circuits during AF.14,15 These rotors consisted of circulating areas of conduction that spawned spiralling wavefronts of activation at their periphery (Figure 1). Although the concept of rotors and their contribution to sustained episodes of AF have now been well described, their properties and viability as effective ablation targets remain controversial. Initially, the spatiotemporal stability of these rotors was challenged. However, their reproducibility in experimental and clinical studies suggests their relative stability when appropriate mapping techniques are utilised.16 Whether these sources can be accurately and reproducibly identified during ablation and whether they represent practical and effective ablation targets to reduce long-term AF recurrences remains to be seen. Since then, technological advances have facilitated attempts to directly map wavefront propagation during AF instead of using secondary markers to localise AF sources. One such tool, called electrocardiographic imaging (ECGI), is a non-invasive system integrating a high-resolution surface ECG with up to 250 electrodes to a real-time computed tomography image of the heart. Body surface obtained electrograms are mapped to the epicardial surface of the heart to provide real-time activation mapping.22 Other strategies utilising intracardiac mapping technologies to directly map AF sources during catheter ablation are described below. Early results utilising this method during 107 ablations performed at two centres showed AF termination in 56 % of cases (and AF slowing in an additional 30 %) after targeting a mean of 2.1 sources per patient. In this study, FIRM-guided ablation plus conventional ablation showed higher freedom from AF after a median of 273 days of follow-up (82.4 % versus 44.9 %; p<0.001) compared to conventional ablation alone after a single procedure.24 A recent single-centre registry of 170 patients undergoing FIRM-guided ablation showed termination of AF with ablation to sinus rhythm or atrial tachycardia in 59 % of patients with paroxysmal AF, 37 % of patients with persistent AF and 19 % of patients with long-standing persistent AF.25 Right atrial ablation terminated AF in 22 % of cases. Freedom from atrial arrhythmias at 1 year was 77 % for paroxysmal AF, 75 % for persistent AF and 57 % for long-term persistent AF. Further publications from other centres have had mixed results.26,27 A recent meta-analysis comparing 511 patients undergoing AF ablation utilising a strategy of PVI plus FIRM to 295 patients undergoing PVI alone suggested similar 1-year success rates off antiarrhythmic medications between the PVI plus FIRM versus PVI alone groups (50 % versus 58 %, p=0.21).28 Another meta-analysis comparing ablation targeting drivers for AF to conventional strategies across 30 studies showed a higher rate of freedom from atrial arrhythmias at one year (RR 1.34, 95 % CI [1.05–1.70]; p=0.02) when targeting AF sources.29 The majority of the studies in this analysis, however, were not randomised and the strategies employed in both the study and control arm were varied. These analyses highlight the necessity for a large-scale randomised controlled trial directly comparing ablation targeting AF sources to conventional strategies. While FIRM-guided ablation likely represents the most rigorous attempt to directly map and ablate AF sources, other studies have evaluated alternative techniques. 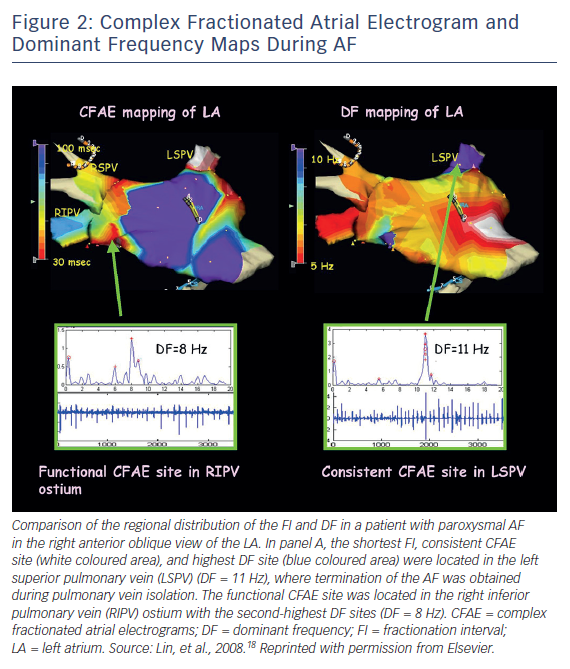 One recent study looked at a much simpler electrogram activation map-guided approach.30 In this study, a 20-pole high-density mapping catheter was used to visually identify sites of centrifugal activity presumed to be AF sources. These sites were ablated along with sites where there was defragmentation. Only a minority of patients (9 %) experienced AF termination after ablating the presumed sources and the improvement in freedom from AF at 1 year (57 % versus 38 %, p=0.009) compared with a traditional step-wise approach was driven by a reduction in recurrences of atrial tachycardia. Another panoramic mapping system using a 64-pole basket catheter (CARTOFINDER, Biosense Webster) was recently introduced for mapping and ablation of AF sources. An initial study reported identifying AF sources in 19 of 20 patients, with AF termination during ablation at 12 of 26 identified drivers and AF slowing at an additional 10 locations.31 Long-term clinical results utilising this system are pending. Ablation targeting AF sources presents an exciting new technology that warrants further investigation as a potential adjunctive ablation strategy. However, clinical studies to date have not yielded sufficient evidence to substantiate superiority to conventional ablation strategies. Several explanations may account for this. Existing mapping technology may identify some but not all AF sources responsible for maintaining AF. The ability to effectively ablate identified sources may also be limited, either in terms of the precise localisation of ablation lesions or the ability to provide durable, transmural lesions. The most significant reason, however, may be that even durable ablation of current AF sources may not sufficiently alter the atrial substrate to prevent the emergence of other drivers. This problem is compounded by the fact that the atrial substrate itself often changes over time, promoting recurrences of AF despite effective ablation of previous drivers. The mechanisms driving the initiation and perpetuation of AF remain complex and incompletely understood. Experimental and clinical mapping technologies have demonstrated the ability to identify local and stable sources that may contribute to the perpetuation of AF. Ablation of these sources has not yet consistently and reproducibly translated to improved clinical outcomes. This is probably due to multiple reasons, including limitations in the currently available mapping and ablation technologies and our incomplete understanding of the most reliable strategy for the long-term elimination of AF. These issues are being addressed by many investigators and it seems likely that improvements in our ability to identify and ablate current and future AF sources will improve over the next few years. Kneeland PP, Fang MC. Trends in catheter ablation for atrial fibrillation in the United States. J Hosp Med 2009;4:E1–5. Deshmukh A, Patel NJ, Pant S, et al. In-hospital complications associated with catheter ablation of atrial fibrillation in the United States between 2000 and 2010: analysis of 93 801 procedures. Circulation 2013;128:2104–12. Colilla S, Crow A, Petkun W, et al. Estimates of current and future incidence and prevalence of atrial fibrillation in the U.S. adult population. Am J Cardiol 2013;112:1142–7. Cappato R, Calkins H, Chen SA, et al. Updated worldwide survey on the methods, efficacy, and safety of catheter ablation for human atrial fibrillation. Circ Arrhythm Electrophysiol 2010;3:32–8. Latchamsetty R, Morady F. Long-term benefits following catheter ablation of atrial fibrillation. Circ J 2013;77:1091-6. Mitteilung I. Über die Wirkung des N. vagus und accelerans auf das Flimmern des Herzens. Pflügers Arch Physiol 1907;117:223–56 [in German]. Mines GR. On dynamic equilibrium in the heart. J Physiol 1913;46:349–83. Moe GK. A conceptual model of atrial fibrillation. J Electrocardiol 1968;1:145–6. Mann I, Sandler B, Linton N, Kanagaratnam P. Drivers of atrial fibrillation: theoretical considerations and practical concerns. Arrhythm Electrophysiol Rev 2018;7:49–54. Haïssaguerre M, Jaïs P, Shah DC, et al. Spontaneous initiation of atrial fibrillation by ectopic beats originating in the pulmonary veins. N Engl J Med 1998;339:659–66. Oral H, Chugh A, Good E, et al. A tailored approach to catheter ablation of paroxysmal atrial fibrillation. Circulation 2006;113:1824–31. Zaman JAB, Baykaner T, Schricker AA, et al. Mechanistic targets for the ablation of atrial fibrillation. Glob Cardiol Sci Pract 2017:e201707. Narayan SM, Krummen DE. Targeting stable rotors to treat atrial fibrillation. Arrhythm Electrophysiol Rev 2012;1:34–8. Jalife J. Rotors and spiral waves in atrial fibrillation. J Cardiovasc Electrophysiol 2003;14:776–80. Guillem MS, Climent AM, Rodrigo M, et al. Presence and stability of rotors in atrial fibrillation: evidence and therapeutic implications. Cardiovasc Res 2016;109:480–92. Nademanee K, McKenzie J, Kosar E, et al. A new approach for catheter ablation of atrial fibrillation: mapping of the electrophysiologic substrate. J Am Coll Cardiol 2004;43:2044–53. Lin YJ, Tai CT, Kao T, et al. Consistency of complex fractionated atrial electrograms during atrial fibrillation. Heart Rhythm 2008;5:406–12. Providência R, Lambiase PD, Srinivasan N, et al. Is there still a role for complex fractionated atrial electrogram ablation in addition to pulmonary vein isolation in patients with paroxysmal and persistent atrial fibrillation? Meta-analysis of 1415 patients. 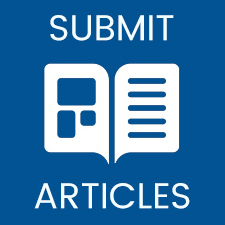 Circ Arrhythm Electrophysiol 2015;8:1017–29. Li WJ, Bai YY, Zhang HY, et al. Additional ablation of complex fractionated atrial electrograms after pulmonary vein isolation in patients with atrial fibrillation: a meta-analysis. 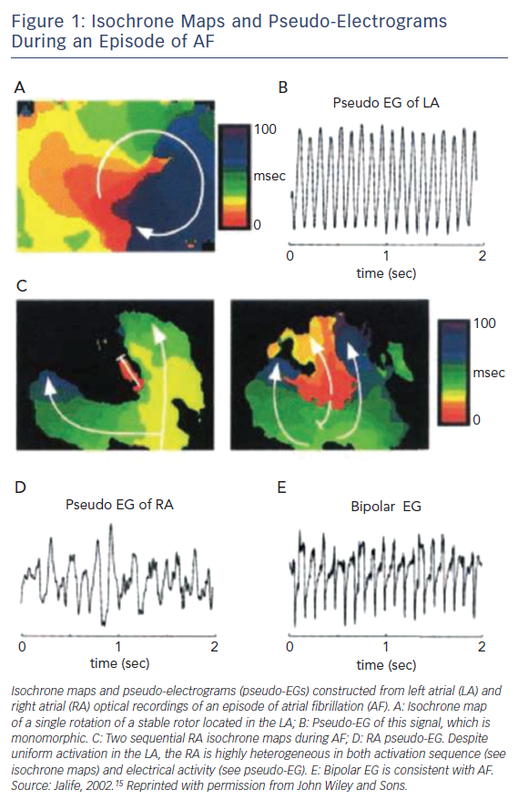 Circ Arrhythm Electrophysiol 2011;4:143–8. Gadenz L, Hashemi J, Shariat MH, et al. Clinical role of dominant frequency measurements in atrial fibrillation ablation – a systematic review. J Atr Fibrillation 2017;9:1548. Rudy Y. Noninvasive imaging of cardiac electrophysiology and arrhythmia. Ann N Y Acad Sci 2010;1188:214–21. Narayan SM, Baykaner T, Clopton P, et al. Ablation of rotor and focal sources reduces late recurrence of atrial fibrillation compared with trigger ablation alone: extended follow-up of the CONFIRM trial (Conventional Ablation for Atrial Fibrillation With or Without Focal Impulse and Rotor Modulation). J Am Coll Cardiol 2014;63:1761–8. Narayan SM, Krummen DE, Shivkumar K, et al. Treatment of atrial fibrillation by the ablation of localized sources: CONFIRM (Conventional Ablation for Atrial Fibrillation With or Without Focal Impulse and Rotor Modulation) trial. J Am Coll Cardiol 2012;60:628–36. Miller JM, Kalra V, Das MK, et al. Clinical benefit of ablating localized sources for human atrial fibrillation: the Indiana University FIRM Registry. J Am Coll Cardiol 2017;69:1247–56. Steinberg JS, Shah Y, Bhatt A, et al. Focal impulse and rotor modulation: acute procedural observations and extended clinical follow-up. Heart Rhythm 2017;14:192–7. Buch E, Share M, Tung R, et al. Long-term clinical outcomes of focal impulse and rotor modulation for treatment of atrial fibrillation: a multicenter experience. Heart Rhythm 2016;13:636–41. Mohanty S, Mohanty P, Trivedi C, et al. Long-term outcome of pulmonary vein isolation with and without focal impulse and rotor modulation mapping: insights from a meta-analysis. Circ Arrhythm Electrophysiol 2018;11:e005789. Ramirez FD, Birnie DH, Nair GM, et al. Efficacy and safety of driver-guided catheter ablation for atrial fibrillation: A systematic review and meta-analysis. J Cardiovasc Electrophysiol 2017;28:1371–8. Takahashi Y, Yamashita S, Suzuki M, et al. Efficacy of catheter ablation of focal sources in persistent atrial fibrillation. J Cardiovasc Electrophysiol 2018. Honarbakhsh S, Schilling RJ, Dhillon G, et al. A novel mapping system for panoramic mapping of the left atrium: application to detect and characterize localized sources maintaining atrial fibrillation. JACC Clin Electrophysiol 2018;4:124–34.